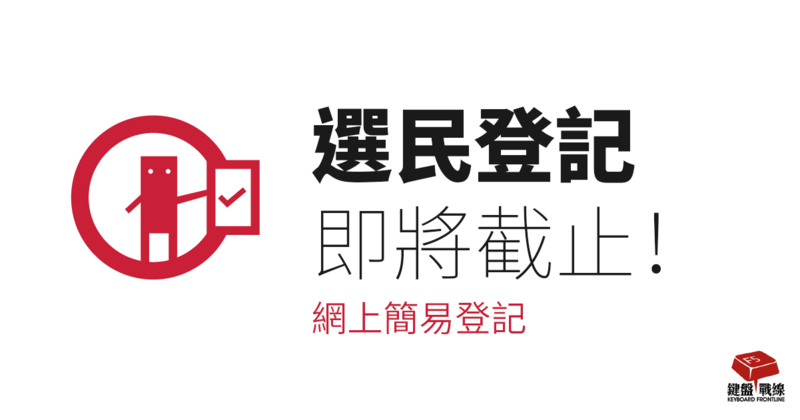 voter-registration is a Keyboard Fontline campaign, you may contribute to the project on Github. Live code is also avaliable for review there. WAIVER OF LIABILITY: In no event shall Keyboard Frontline be liable for any consequential, incidental, indirect, special, or punitive damages incurred by you and arising out fo the use of this program, whether or not such loss or damage is based in contract, warranty, tort, negligence, strict liability, indemnity, or otherwise, even if Keyboard Frontline has advised you of the possibility of such damages. These limitations shall apply nothwistnading any failure of essential purpose of any limited remedy. The maximum totaly libality of Keyboard Frontline shall not be more than HK$1 in any event. You shall fully indemnify and hold Keyboard Frontline harmless from and against any and all claims of any kind arising out of the use of this program including any and all expenses, costs, legal fees, settlements, judgements or awards incurred by you in in the defense of any such claim or lawsuit.